Oh pretty Paris, how I miss you so! 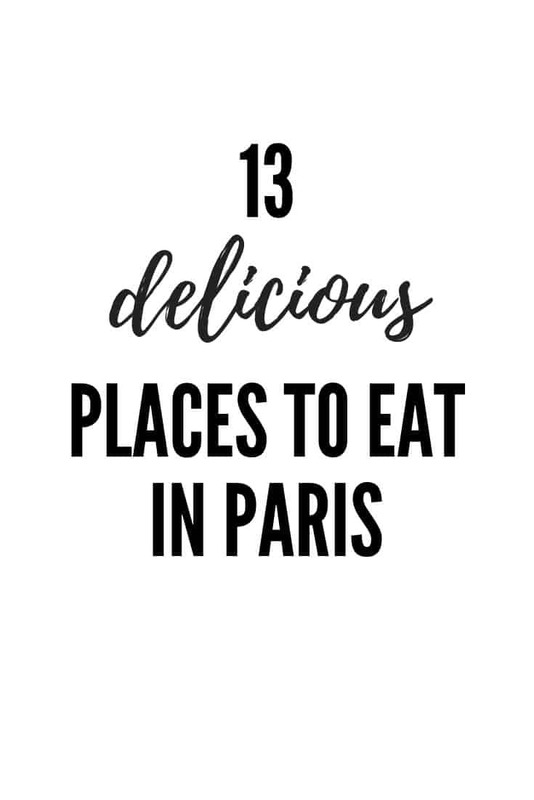 It’s been nine weeks since I visited Paris (for the very first time) and the food memories alone were worth the 25 hour flight. I still have strong visions of flaky croissants, buttery caramels and the best falafel I’ve ever had. There were gourmet sandwiches made from soft French bread and big, fat cookies that caused an impromptu dance right in the middle of the cobblestone city streets. Our very first meal in Paris was at Frenchie To Go. We had just arrived after taking the Eurostar from London to Paris, checked into our hotel, dropped off our bags and had about 30 minutes before we needed to hop onto the metro to make it to our Le Cordon Bleu bread making class. My head was spinning and we were hungry. 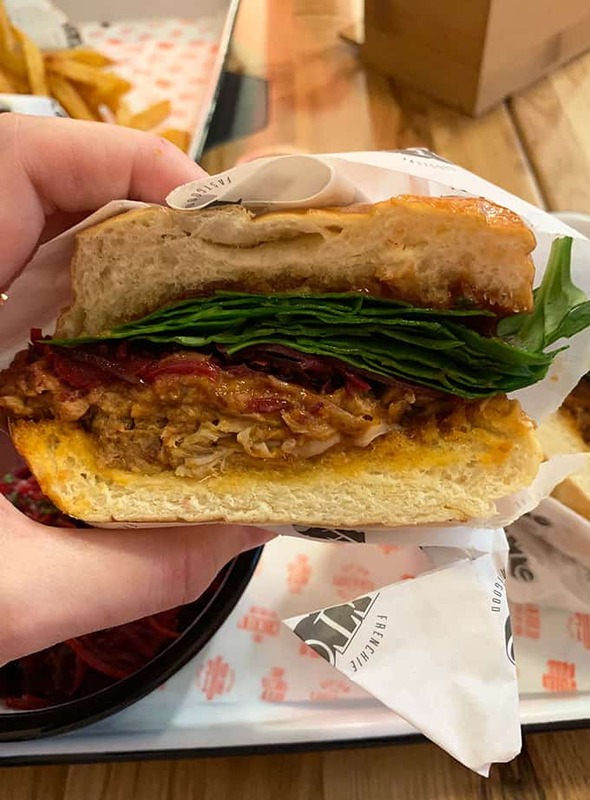 Thankfully, Frenchie To Go was on our list for its mouthwatering sandwiches and was situated just around the corner from our hotel. I absolutely loved Big Love. In fact, I couldn’t wait to go there after seeing photos of their food online – it was at the top of my list. The cafe is tucked away down a side street without much signage – it is VERY easy to walk right past (in fact we did a few times – thank goodness for Google Maps). But step inside and you’ll see that this hipster French restaurant oozes charm with plenty of quintessential French flavour. Their hot chocolate was rich and creamy – without being too sweet. 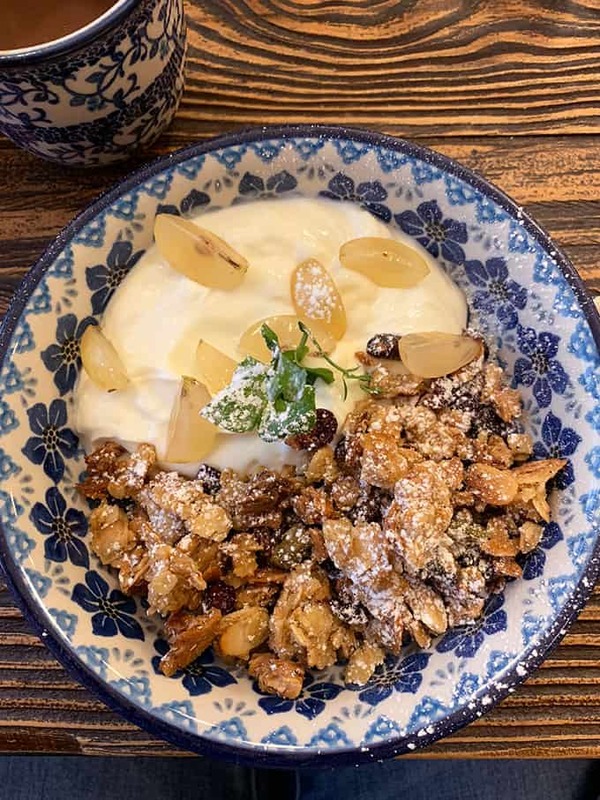 And their granola (pictured above) was easily the best granola AND the best yoghurt I’ve ever had. I don’t know even know why, but in that moment I realised Paris really knows what it’s doing when it comes to food. I was delighted. If you plan to come here, it’s a good idea to book. By the time we finished our breakfast, there was a line streaming right outside the door. Want to know a not-so-secret secret? I used to work full time as a travel writer and I used to write about places all across the globe. 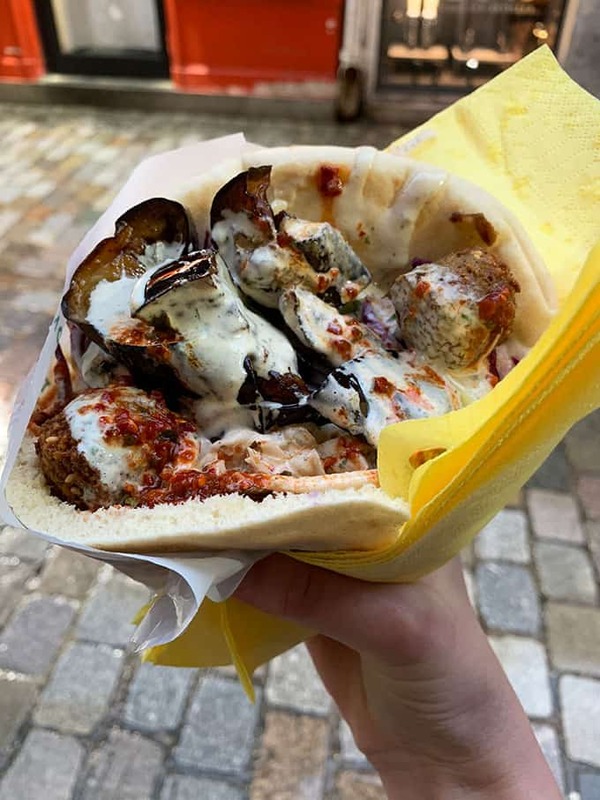 I remember, probably about five or six years ago writing and researching about Paris and seeing L’As Du Fallafel on so many blogs and publications. I was a little skeptical at the time – you go all the way to Paris and eat falafel? Needless to say, the 4,000+ reviews on Trip Advisor speak for themselves. 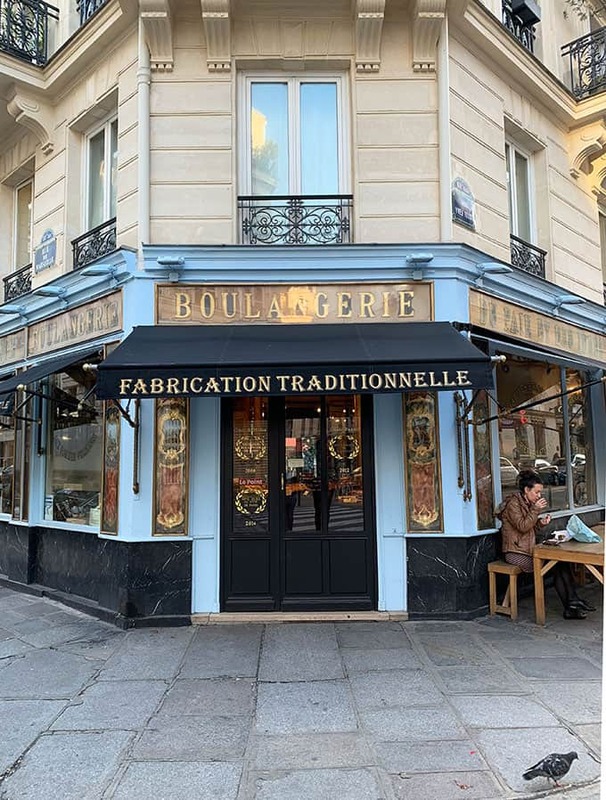 Situated in the Le Marais district, this place is nothing special to look at, but the lines winding their way down the street say it all. This was their signature falafel, I think it costs me around 7 euros, and it was hands down one of the best things I have EVER eaten. The pita, soft and fluffy, the falafel, crisp and moist, the vegies, the sauce – everything. It’s pure heaven wrapped in a yellow napkin. 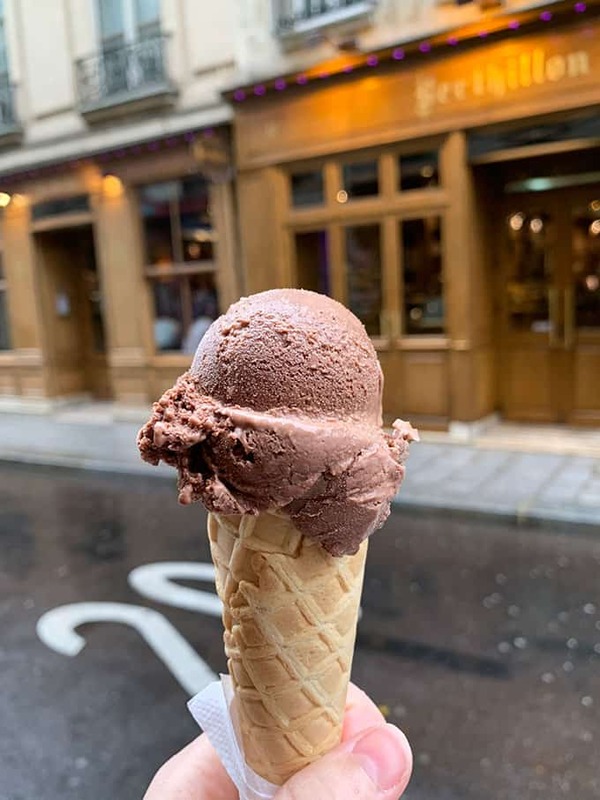 A huge shoutout to one of my Instagram followers who sent me a message and told me that I HAD to go to Scoop Me A Cookie while in Paris. 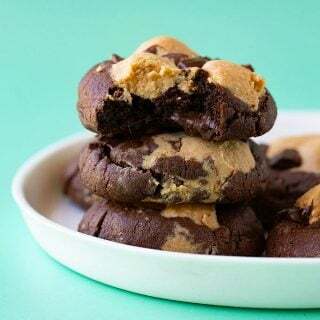 I will never say no to a cookie. But I have to be real – I wasn’t sure about this place. 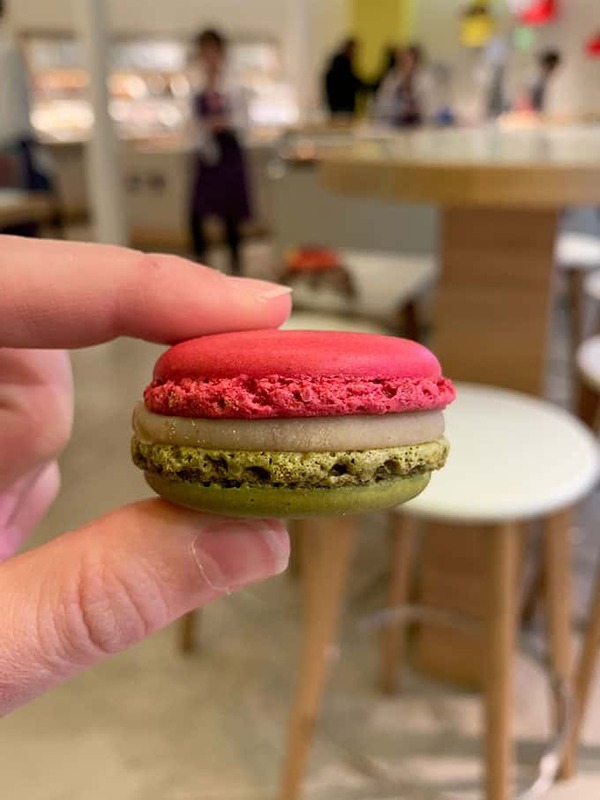 I’ve tasted very, very good cookies in New York, Los Angeles and London – what did Paris know about making a good cookie? Well thank goodness, Scoop Me A Cookie was there to prove me wrong. Oh-so-wrong. I tried three different cookies. 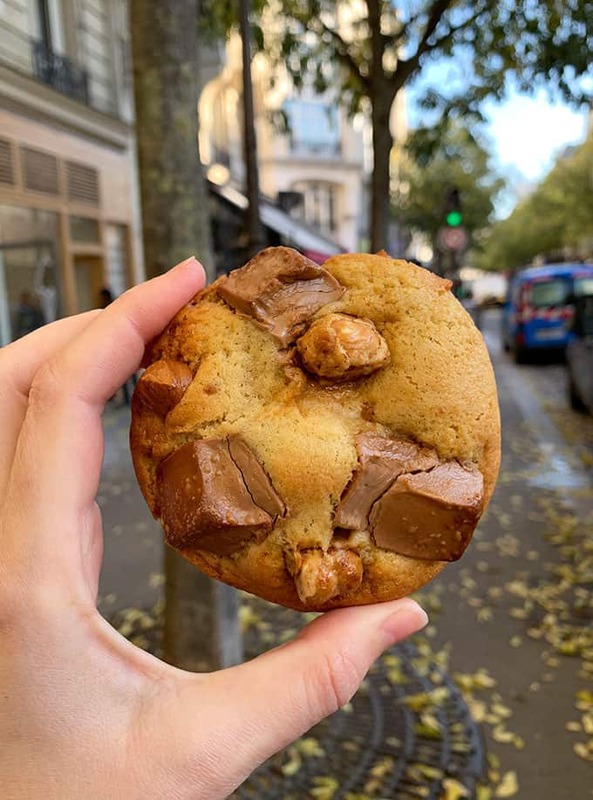 Their caramel cookie, their chocolate cookie with white chocolate chunks, and the one picture above (recommended to me by their staff), their best-selling caramelised hazelnut praline cookie. Soft, sweet and still warm. These were the best cookies I’ve ever had. No contest. You can’t go to Paris without having lunch at a fromagerie, amiright? Well I’m so thankful we made it to Fromade Darnard. Husband and I had a magical food moment here – one that we will never forget. The cheese shop itself is humble in appearance, but make no mistake, this was some of the best cheese and meats I’ve ever had in my life. Once you choose the size plate you would like, the kind staff put it together for you with an assortment of their best produce. 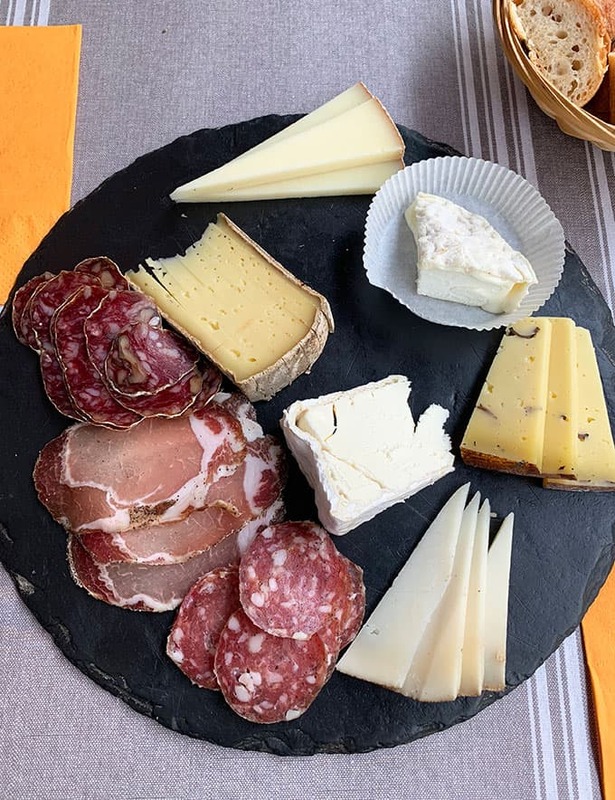 We had a selection of cow’s and goat’s cheeses, along with freshly sliced salami and jamon. Du Pain Et Des Idees is a well-known, award-winning bakery, famous for their beautiful baked goods. We went there early one morning and tried their croissants, les escargots and the la chocolatine. Every golden pastry was delectable. The staff were also so friendly and more than willing to help out two hungry English-speaking Aussies! I remember hearing about Berthillion a few years ago, so I couldn’t wait to try their much-lauded ice cream. 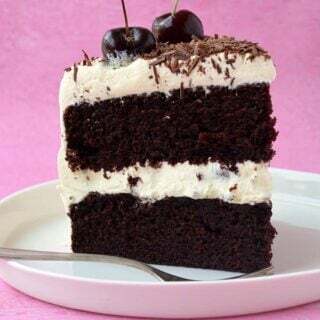 I found ordering a little overwhelming because they had so many flavours (and I couldn’t remember my French) but ended up going with chocolate, while hubby went for rum and raisin. Paris changed my mind about many things, including eclairs. Before I tried this eclair, I would have always opted for a cookie or a brownie instead of an eclair. The ones I’d previously tried were basically soggy pastry with a tasteless filling. 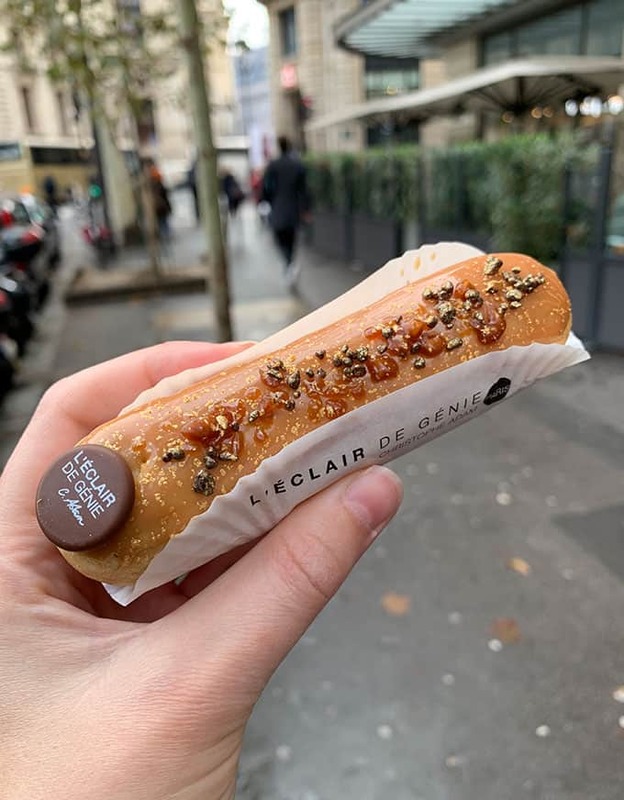 But thanks to Le Eclair De Genie, I now know what a real eclair is supposed to taste like and let me tell you – it is EPIC. I tried their caramel eclair. It boasts a light and buttery pastry shell filled to the brim with the richest, creamiest caramel filling I’ve ever tasted. Honestly, I will never forget how intense the caramel flavour was – I’ll be forever trying to recreate that flavour in my kitchen for years to come. 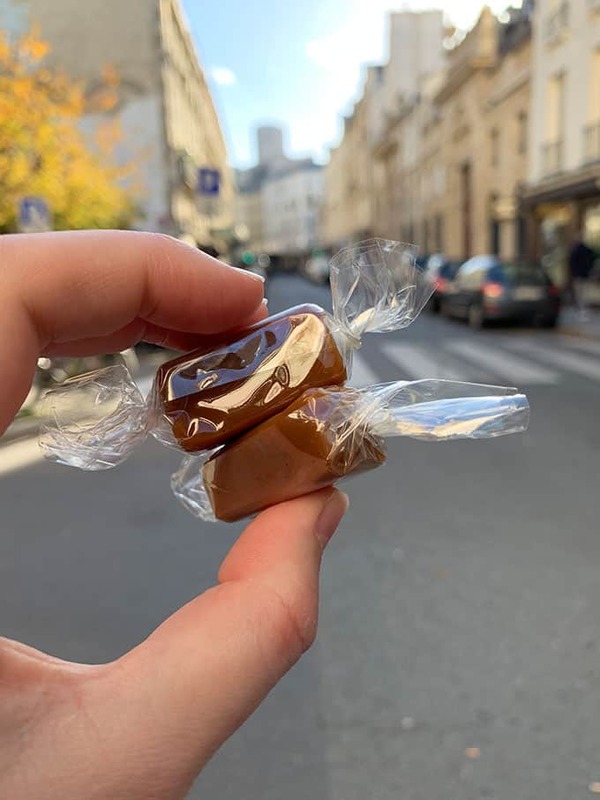 Speaking of caramel, I just have to say, these caramels changed my life. I walked into Jacques Genin and was in awe of the luxury fit-out and the array of hand crafted caramels and chocolates. So much so, that I think I tried nearly every caramel in the store – the original, vanilla, honey, macadamia and mango-passion. Honestly these are up there as some of the BEST confectionary I’ve ever tasted. I don’t know what is in them but they are sweet perfection. I’d book a trip back to Paris just to eat these again. 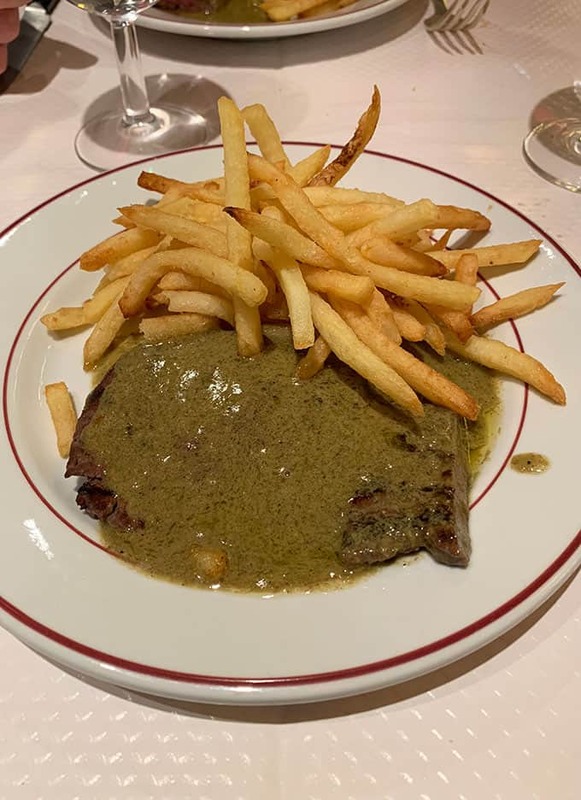 One dish we really wanted to try in Paris was steak frites and so many people recommended La Relais de Entrecute as the go-to. And it turned out to be quite the experience. Once we were seated in this popular French bistro, we weren’t given a menu because there was only one thing on the menu – steak frites. First, we were served a simple garden salad and some bread. Next came the steak smothered in their famous sauce, alongside a generous serving of golden fries. Certainly not the most nutritious meal, but it was indeed tasty. Then just as we finished our plates (and thought we were doing quite well), the waitress hurried over and dumped a whole other steak and another stack of fries onto our plates – despite our protests. I don’t know if this is protocol or not because we don’t speak French, but the whole experience was quite entertaining as we had to start all over again. Needless to say, you won’t go hungry here. I first heard about Ble Sucre from David Lebovitz. 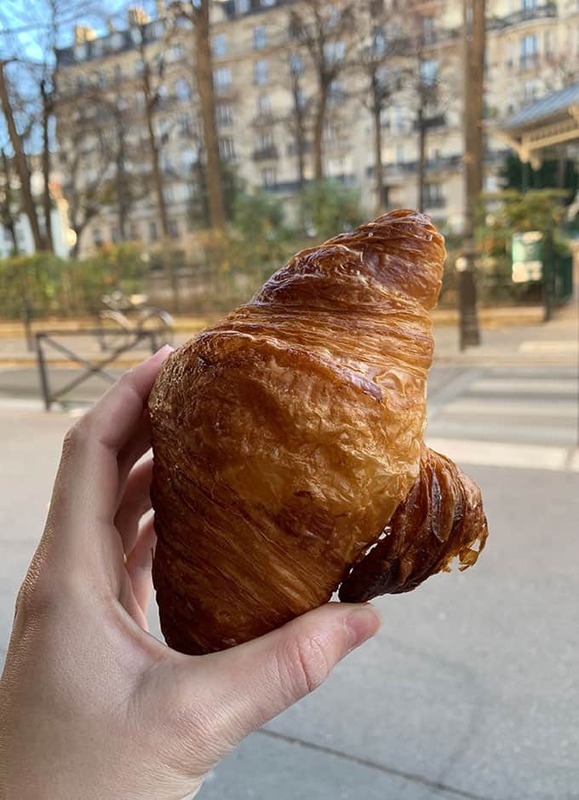 He boldly states it’s the best croissant in Paris and after going there, I can’t argue with him. We tried a regular croissant and a chocolate croissant. The generously-sized pastries were heavenly, with crispy layers and a delicious chew. I’m quite sure croissants will never be the same. We stumbled on this place by accident – which doesn’t happen very often since we like to plan most of our stops. 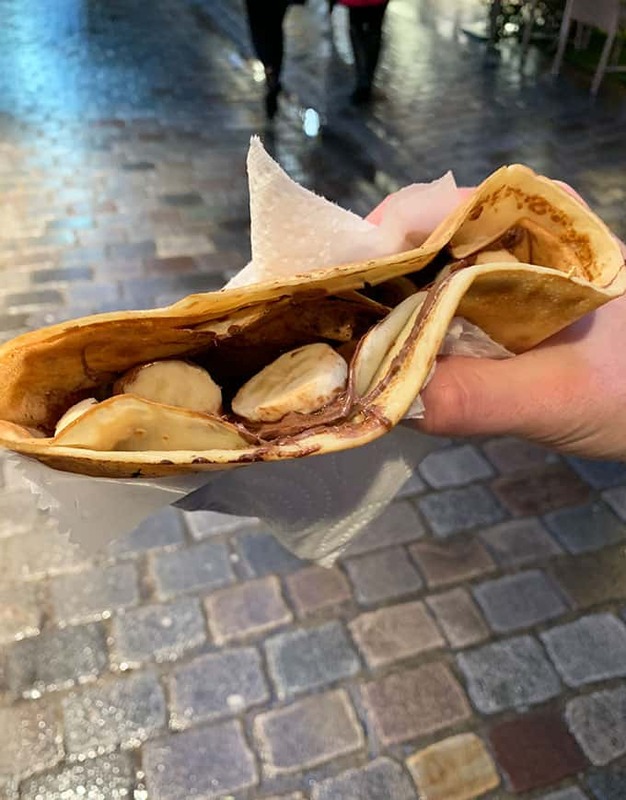 Just a few doors down from L’As Du Fallafel, this tiny crepe store churns out freshly made crepes with a variety of fillings. 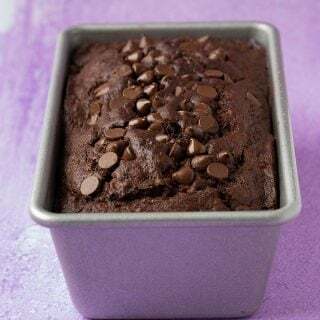 Of course, I chose Nutella and banana – and I recommend you do the same. It was divine. The warm crepe simply oozes with chocolate goodness and makes for the perfect dessert on-the-go. 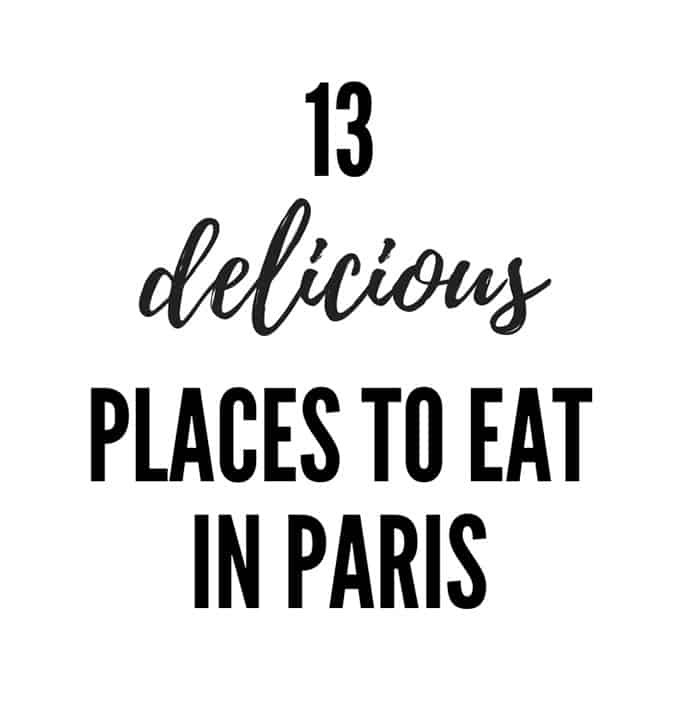 Tell me, where are your favourite places to eat in Paris?